Saturday 8th & Sunday 9th December 2018, 7.30pm. 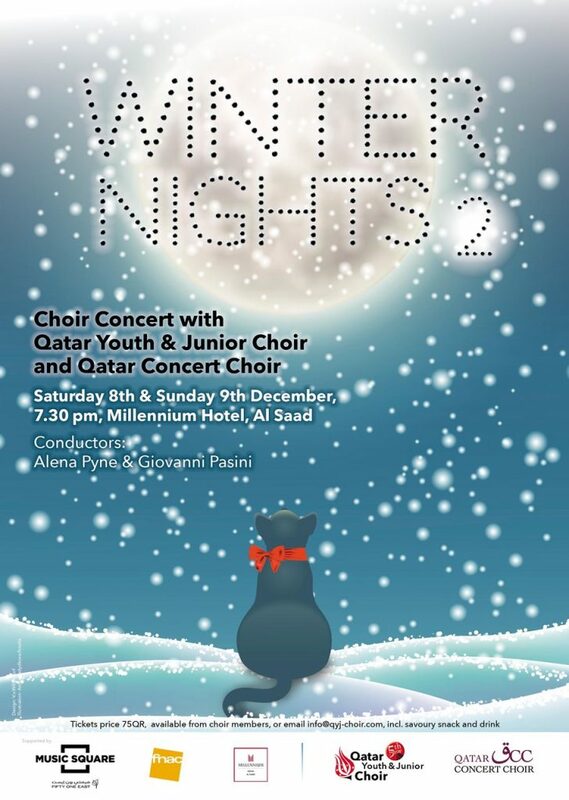 Qatar Youth & Junior Choir, Qatar Concert Choir and Doha Chamber Choir are delighted to invite you to their second annual Winter Nights Concert! Come and join us for a festive evening of winter melodies. available from choir members or book at info@qyj-choir.com. There will be no tickets sale at the door. Be the first to hear about our concerts and purchase early bird tickets. Thanks CineMoon for yesterday’s amazing concert! We loved singing with you for such an enthusiastic public! Calling all #singers in Qatar...QCC is recruiting new members. If you want to sing a wide range of classical and popular #choral music and take part in some great #concerts coming up, fix an audition. All the details are below - or simply call 7011 8887.